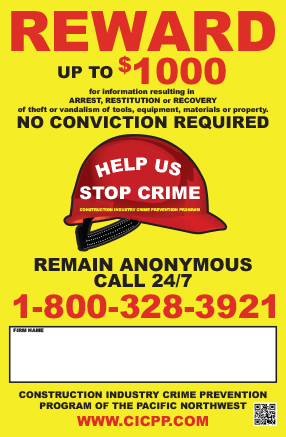 CICP provides a 24/7 hotline and reward program making it easy to report suspicious activity on jobsites and at yards and facilities. Reward signs are a first line defense against thieves. These large and colorful signs engage workers on the site, are visible to people driving by and businesses in the area. They announce that criminal activity is not acceptable on this jobsite. 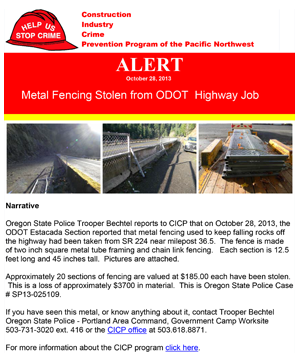 CICP distributes ALERTs to CICP members and law enforcement officials throughout the Pacific Northwest region. ALERT’s provide information about losses and/or recoveries. The ALERTs also provide information about how thieves are getting onto jobsites, what items they are taking, and specific steps that contractors can implement to make their jobsites less vulnerable to criminal activity. Nearly 1000 people regularly receive CICP ALERTs. - this is a substantial number watching out for stolen property. The ALERT system is also used to notify scrap metal recyclers about metal thefts. 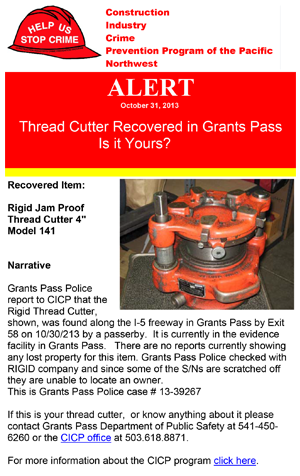 Law enforcement officers often use the system to distribute information about recovered items when the owner is not known. CICP staff will come to your jobsite or equipment yard to conduct a jobsite walkthrough or security survey.. We will help identify areas that make your jobsite vulnerable to theft and make suggestions to make your site more secure. We coordinate with local law enforcement and often they accompany us on those visits. Jobsite security forms are available to CICP members if you would like to conduct your own survey. CICP helps facilitate jobsite crime prevention planning meetings with local law enforcement jurisdictions before and during a project. CICP also offers assistance to law enforcement when identifying equipment, serial numbers and facilitating sensitive suspect information between property crime detectives in different jurisdictions. Law enforcement can access CICP 24/7 to get contact information for our members when they may be holding suspects or when there is suspicious or unusual activity on the jobsite. 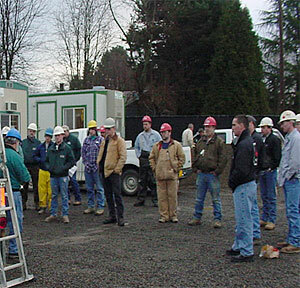 CICP provides members theft prevention education and training at supervisor, toolbox, or company meetings. CICP staff also offers specialized training sessions and presentations at conferences and other special events. Contact the CICP office to schedule a training session. 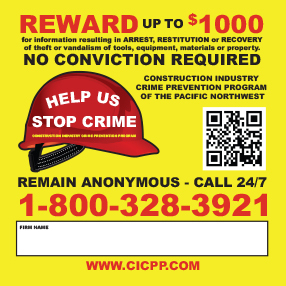 Reward and No Trespassing signs as well as hard hat and tool box stickers are available for a small charge. These signs are your first line of defense and inform people living, working or driving by the jobsite that you are serious about preventing theft.